Interview with Odyssey2 Artist Ron Bradford - The Odyssey² Homepage! A few weeks ago, I had the good fortune of being contacted by Cheryl Bradford. She told me that her father-in-law, Ron Bradford, had done a great deal of design work for the Odyssey². Through subsequent communication with Ron's son David, I learned that Ron and his partner, Steve Lehner, were the principal Odyssey² graphic designers, and had created all the Odyssey² box art and packaging designs! I would later come to learn that Ron and Steve also created designs for the original Magnavox Odyssey systems, and had been the masterminds behind the Master Strategy Series games. Ron Bradford is now retired (Steve Lehner, sadly, has passed away). David encouraged me to send his father some interview questions. Ron answered them in longhand, and mailed them back to me along with a small treasure trove of Odyssey² material, including some graphic designs for the unreleased Sherlock Holmes game! I have scanned them and included them along with the text of the interview below. Please note that to avoid confusion about names, Ron often refers to himself in the third person. You may also be interested to read Ron's business biography, and to read this 1981 newspaper article that Ron sent to me. It goes into greater detail about Ron's and Steve's involvement in the Master Strategy Series. In addition, a high-quality image gallery of artwork that Ron provided can be found here. It contains more photos than what can be found below, so don't miss it! How did you become involved with the production of Odyssey² materials? Ron Bradford of Bradford/Cout design was well recognized for award winning design and illustration in creating logo and packaging programs, game concepts and original games as well as many other graphic areas. One of B/C's accounts was with the Magnavox advertising agency that B/C had done creative work [for] for many years. B/C was brought in to work on the original Odyssey 1, creating the entire packaging program as well as all the games and overlay screens etc. Ron worked with the advertising agency creative writer (and long time friend) Steve Lehner. 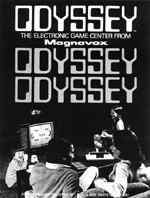 When Magnavox engineered the Odyssey², B/C was asked to create the logo, packaging program and related materials including game development. I think Odyssey² fans would be very interested to hear about the process by which Odyssey² packaging and other materials were created. Please describe how you and your partner went about it. B/C generally approached major projects with an "Exploratory Program" consisting of different graphic and idea concepts. In discussing solutions for the Odyssey² we were looking for something – EXPLOSIVE! That key word generated and became the visual graphics approach for the entire logo and packaging look! There were about 50 Odyssey² games released in the United States. How many of them were you involved with? To the best of my knowledge we designed the graphics for most (if not all) of the Odyssey² cartridge packages and play rule booklets, etc. Odyssey² advertising (including the game titles) is famous for being... let's say "excitable," with a lot of exclamation points and so forth. Did you have anything to do with setting this excited tone? The "excitable" tone for the advertising emerged from the graphic "EXPLOSIVE" look we created in the logo and packaging as well as suggestions for related materials. Was any of your work used for the versions of Odyssey games released outside of the U.S. (i.e. : in Europe or Brazil)? I believe much of the artwork was picked up and used abroad. Let me just say, I think the artwork on most Odyssey² packaging is outstanding. What do you consider your best Odyssey²-related work? Are there any that didn't turn out as good as you had hoped? We used many avenues of graphics – from illustration to electronic photo manipulation. I originally wanted to incorporate day-glo printing inks on the main package to add to the "explosive" look – but cost was a problem. Did you have anything to with the design of the Odyssey² logo? How about the "vanishing point" style used so often on Odyssey² packaging, where it looks like words or other objects are rushing toward you from a distance? As mentioned, B/C was responsible for the entire graphics (logo, all packaging, etc.) from start to finish including supervision of printed materials. What were some of your favorite Odyssey² games? Least favorite? My favorite Odyssey² games were the Master Strategy series which Ron and Steve (who had left the ad agency to go on his own) created together with Ed Averett. After completing Quest for the Rings, Conquest of the World and The Great Wall Street Fortune Hunt, Ron and Steve began a fourth game Sherlock Holmes bringing in their own programmer, Ed Friedman, a computer professor from the University of Chicago. Ron had also been making arrangements for the introduction of the game in London, England, with the Commerce Counselor from the United States, Gerald Marks. Unfortunately, it was during this period when Odyssey² pulled out of the market. Did you ever do any work with video games outside of the Odyssey²? Did you do any other design work that video game fans might be familiar with? B/C did video games design for V-Tech Electronics that produced educational toys and other products as well as a variety of other original games for other companies. How did you feel about your Odyssey² work at the time? Did the fact that you were working with games make the effort more enjoyable, or was it about the same as your other design jobs? Great fun! Working on Odyssey brought together much of my early background in film, TV commercial work and storyboarding, comic books, writing, etc. as well. My involvement was so time consuming that my partner Al Cout had to take over on many of our other accounts. While we were working on the Odyssey² we were also beginning to work on a video laser disc game for Magnavox in which we completely scripted, storyboarded and worked with a film company to select on location sites in Haiti, Jamaica, Dominican Republic, etc. for the actual filming that was to be turned into a series of games in which you the player were seeing and interacting with what would eventually lead you to the solution of "The Curse of the Idol's Eye." Unfortunately Magnavox felt there was not enough hardware selling out in the market to proceed further and the project was canceled. Thanks to Ron, David and Cheryl Bradford for making this interview possible. Be sure to check out the Photo Gallery page for even more pictures! Page design and content © 1996-2019 William Cassidy. Odyssey is a trademark of The Magnavox Company and Philips Electronics. Web site © 1996-2019 William Cassidy. Odyssey © Magnavox / Philips.